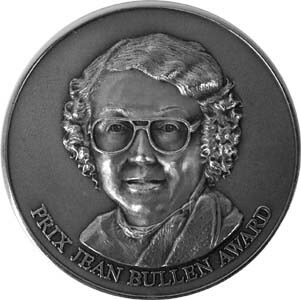 The Jean Bullen Award was established in 2004 as an annual presentation for the best exhibit of Canadian coins displayed by a member at the current R.C.N.A. Convention. At her passing, Jean Bullen made a financial bequest to provide an award for the category she had favoured most - one in which her outstanding Canadian collection frequently took 1st place, and often advanced to win “Best of Show”. The C.N.A. Executive named the award in memory of Jean Bullen and to acknowledge her generous bequest. The prize is a portrait style silver medal, which is presented to the winning exhibitor during the Convention banquet. 2018 Brett Irick "Pedigree Lost and Found"
2015 John Siteman "Colonial One Cent Coin of Nova Scotia (1861 - 1864)"
2014 Chris Boyer "The J.O.P. Dollar"
2013 Chris Boyer "The J.O.P. Dollar"
2012 Randy Nelson "A Timeline of the Canadian Cent"
2011 Henry Nienhuis "Canadian Five Cents - 1951"
2010 Henry Nienhuis "King George V 5-cent Specimen Strikes"